Home | Newsletter 144: Two Million Child Cocoa Workers: Time to Switch Strategies! Newsletter 144: Two Million Child Cocoa Workers: Time to Switch Strategies! Two Million Child Cocoa Workers: Time to Switch Strategies! The International Cocoa Initiative (ICI) calls itself the “leading organization promoting child protection in cocoa-growing communities.” With members like Mars, Hershey, Mondelez, Cargill, and Nestle, they have influence and resources backing them. 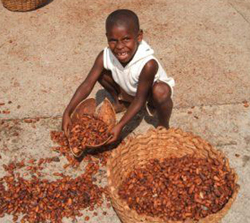 Yet a recent report from Tulane University shows that the number of children working in the cocoa sector in West Africa has increased and more than 2 million children are engaged in hazardous work there. ICI is avoiding the most important solution: ensuring fair payment to farmers. While additional system improvements are also needed, evidence is mounting that it is not possible to continue to pay farmers poverty wages and expect labor abuse, including child labor, to disappear. Tell ICI to address fair pricing for farmers as part of its strategy to eliminate child labor in the chocolate industry! Still Time to Show Support! Earlier this summer, Fair World Project joined a coalition of organizations collecting signatures in support of the Raise the Wage Act to raise the federal minimum wage. This legislation would put money in the hands of our most vulnerable workers and boost the overall economy. Over a half million people signed the petition by the original deadline. To make an even stronger statement, we are extending the deadline. This will allow us not only to collect more signatures, but also to present the petition to Congress when they are back in session in September. 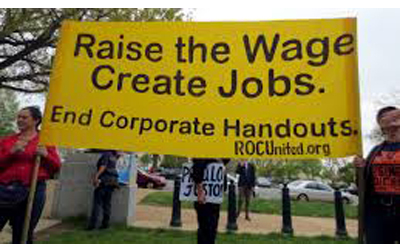 Please sign AND SHARE the petition in support of the Raise the Wage Act now. Let’s show Congress we stand in support of low-wage workers and a thriving economy. For the past several years it seems everywhere we go, farmers talk, unprompted, about changes in the climate. It’s too hot or too rainy or too dry. Not predictable in any case. This means changes in the Harvest. In Peru we heard that the coffee never really stopped ripening so that the pest cycle was never broken. In Nicaragua we visited coffee fields devastated by La Roya, coffee leaf rust. When we traveled to Chiapas, Mexico, we heard similar stories. In Mexico, we also heard about the effects of NAFTA on farmers. We saw that we are on the right track to creating a more just economy, but we need to do more work to connect the dots between the various obstacles to creating a more just economy, including land grabbing, climate change, and corporate consolidation of our food system. The good news is that a lot of this is already happening, with more and more people speaking out against the TPP, for example, the latest trade policy that is expected to have similar effects as NAFTA. Let’s continue to build on this momentum. Consumers and small-scale producers working together can not only feed the world, they can change it. 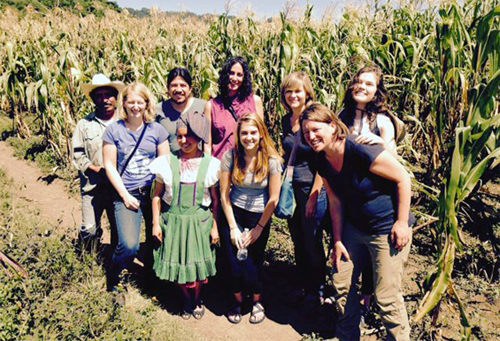 Read our full account of our trip to Chiapas on our blog. Senator Sherrod Brown takes a stand against secrecy surrounding Trans Pacific Partnership (TPP). Over 16,000 people write in support of raising wages for fast food workers in New York to $15/hour. Dean’s Beans on direct trade: there is no such thing. Where other food movements focus on what to eat or where it should come from, fair trade and organic have been pioneers in asking how it is produced and traded. Find links to these articles and more on our Facebook page.